World population is getting increasingly urban, as it is showed in many of UNESCO and UN studies. The infrastructures of most urban spaces are already there, ready to be used and re-used in a more sustainable way. It seems logical that in order to meet the need s of growing populations in the city we developed green buildings that feed from the urban infrastructure, and relate in a ecological way with its surroundings. I proposed a high density mix used building in the Rincon Hill special District of San Francisco where a new zoning with a “high density and high rise” approach was staring to be implemented (2004). After a careful study of the site and regional needs I developed an ecological mixed use building in “U” shape, that had natural ventilation, solar heating solar panels and collectors, re-used green water and collected rain water among other green systems implemented. Commercial, residential and community spaces where mixed throughout the vertical structure. Every four stories a corner was open to create big spaces for the community to interact (sport facilities, community centers, etc). Towards the courtyard the recycled grey and rain water was used to irrigate the community gardens that were hanged over vertical scaffolding-like structures. 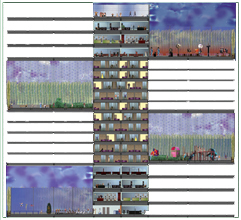 Design of a mid density green community near the summer palace in Beijing, China. In view of the increasing and fast redevelopment of the city with high rise complex, the Tsinghua University invited Professor Jan Wampler of MIT to developed a proposal for the authorities to show the possibility of developing a green development in the area where the descendants of the builders and servants of the summer palace still live, in traditional huttons. The idea was to show a mid size development that captures the essence of traditional life in the huttons with a contemporary and sustainable approach, inviting the current dweller to stay in their area. Professor Wampler invited in UC Berkeley, chose a team that went with him to China to meet with the Chinese University and the Huttons residents to understand their needs and developed the project. I was part of it, and developed a project with mid-rise courtyard buildings that had growing vertical gardens/farm made out of bamboo structures similar to the traditional bamboo scaffolding. My lot also had a front to the main street with small commercial units, and a big community garden and farm that transition into the residential area. This was developed in answer to a big necessity of a growing almost collapsed city. The transport city was projected to encourage public transportation and help with the biggest problems of the city at the time: traffic and contamination. There was an old plan of continue the long time discontinued train railroad, taking them to the city and eventually connecting them with the whole continent. Also there was de need of extending the subway and plans of a new end of the line station in the selected area. Among all the discussion in transport there was pending the relocation of the bus terminal for the west side of the country. 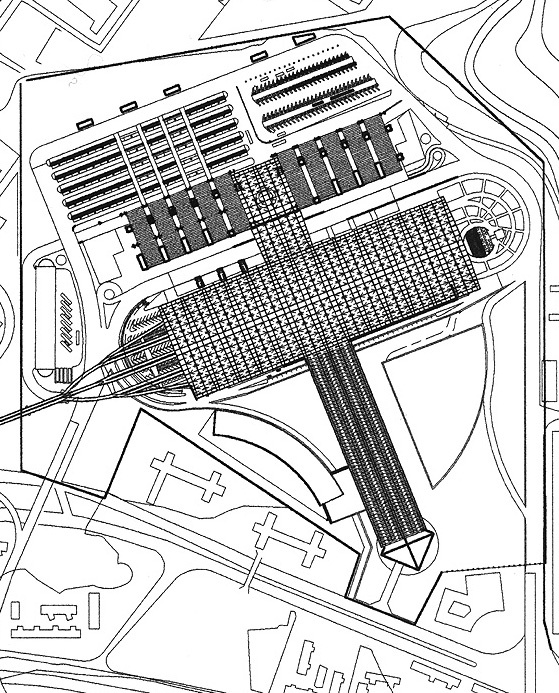 This “city of transport” would connect all of those terminals in adding a high rise hotel, and a shopping center in a carefully studied lot. The first semester of this thesis was a study of the city needs, the transportation department approach, an ideal site selection and real feasibility of the project, together with the first volumetric responses for the site. The second semester was the development of the project and the structure that support it. Then I developed the design of the train and subway terminals with detail while other teammates developed the bus station and hotel. Life In Green Designs Copyright © 2015 - 2019 All Rights Reserved.